With the freedom of a trip designed by and for us, we determined that it would be downright stupid to pass up the chance to revisit our favorite place on the planet. That’s why we booked three months in New Zealand. That’s right, 3 months. It’s the longest length of time we’ll be spending in any one country on our journey. You may think we’re crazy, but love does that to a person. And we love New Zealand! Back in 2011, Katie and I hiked one of New Zealand’s “Great Walks”, The Milford Track. It was one of the most difficult and gratifying experiences we’d ever had. 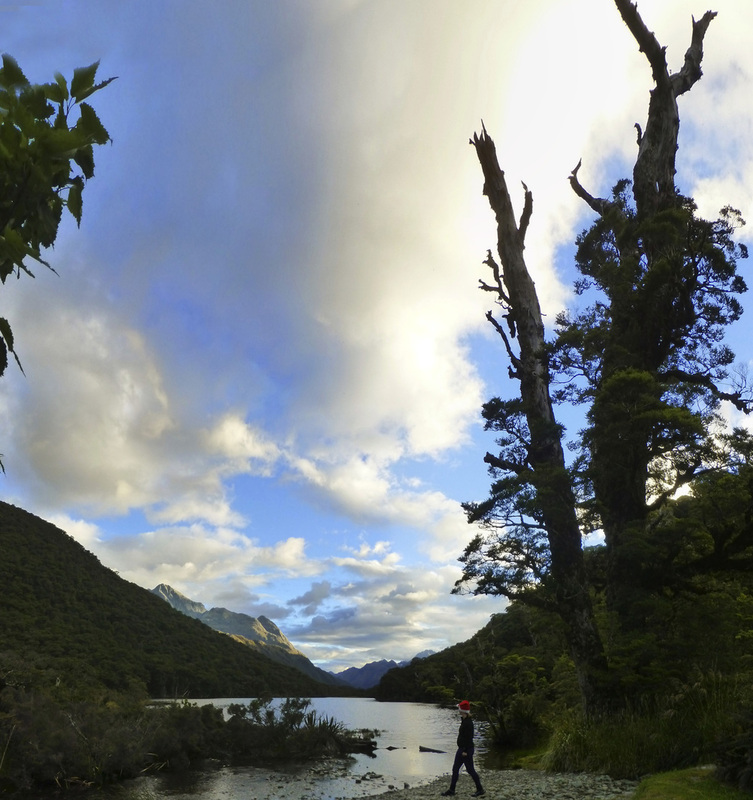 Eager to recreate that adventure, we decided to take a stab at another “Great Walk”, The Routeburn Track. This is one of the easiest and most accessible of New Zealand’s multi-day hikes, but it’s no walk in the park. It’s 20 miles long and takes 2-3 days to complete (though some powerhouses quick-foot it in just one day!). It’s a stroll, to be sure, but it’s not likely to bash your knees in and make you cry for mommy. It seemed that Katie and I, though, were anxious for punishment. We decided to extend our Routeburn hike, connecting onto Caples Track and effectively stretching 3 days into 5, and 20 miles into 38. We felt confident that after the pains of hiking to Machu Picchu and through Patagonia we were ready for the challenge. And Christmas seemed the best time to give ourselves a good walloping! The unfortunate thing about the day’s weather was that it blocked our view of the valley. Heavy clouds hung low as we peered out of the large pane windows of Routeburn Falls Hut. We tried in vain to dry off despite the moist chill in the air. Katie attempted to start a fire in the wood-burning stove but didn’t have the necessary components (wood, for starters), so we warmed ourselves inside-out with freshly brewed coffee. Luckily, the weather suddenly broke and the clouds parted, revealing a stunning valley floor with surrounding emerald mountains. We jumped up and ran outside, scampering up to Routeburn Falls whose torrents were sluicing and pummeling the mountainside. I turned and breathed in deeply, grinning like a fool. The vista was so spectacular that I started jumping for joy, pumping my fists like Rocky. We were back in New Zealand and it was just as incredible as I remembered – nay, better! Katie joined me in my exuberance, hopping like a child on Christmas morning. Which was appropriate, for it was Christmas Eve, and we were getting our presents early. We were some of the last people to hit the hay and, considering our late cup of coffee, we both knew it might be difficult for us to fall sleep. The coffee was nothing compared to what awaited us in the dorm. We snuck in quietly, a dim light guiding our way, when a low rumble arose and grew as we inched closer to our beds. Unfortunately, that rumble resided right next to us; a deafening snore that rivaled that of my mother (and that’s saying a lot!). Disappointed with our luck, we each got into bed and dealt with it as best we could. I chose to listen to Christmas music, hoping my ear buds would block out all other sound. (No such luck.) Katie, who was on the lower bunk adjacent to the offending snore-bear, had zero success drowning out the maddening sound. In the wee hours of the morning, having reached a furious exhaustion, she resorted to pulling her sleeping bag off and flinging it into the darkness onto the sleeping form. The droning continued. In desperation, she abandoned all sense of courtesy and flat-out kicked their bunk. Surely an earthquake would jostle them awake? (Negative.) The invisible man (or woman) refused to be disturbed and kept us awake most of the night. When dawn broke, we discovered the sleep-stealers were none other than the Bostonians! For some odd reason, they’d squeezed themselves together into one bunk, so we’ll never know who the true offender was (perhaps both?). We now knew to steer clear of them whether awake or asleep. They gathered their belongings (very loudly, I might add) while Katie and I plugged our ears with pillows over our heads. The dorm was shockingly quiet in their absence. We wore our Santa hats on our second day of hiking, for it was Christmas day and they kept our heads warm in the cold mountain air. We followed Routeburn Falls up and traced the streams that fed it into a wide-mouthed gorge. With each step I marveled at the massive boulders covered in lichen and ached to pick up every rock under my feet. The stones of Routeburn radiated more hues of green than I knew existed. In moments of weakness I would grab one (or two, or ten) but I knew it wasn’t sustainable. We were hiking, after all, and I couldn’t keep picking up rocks when my only adversary on the trail was my own weight. Katie was suffering from the same addiction. When we’d stop for a break we’d each pull out our loot and pick the best of the bunch. It was strangely difficult. In the end we probably packed on an extra pound each. We were supposed to be losing weight while trekking, not gaining it! The wiggling tributaries led us up to an alpine lake. Katie’s red hat brightened in contrast to the deep blues and greens surrounding us, like a Christmas elf unveiling a magical land. The mists thickened and urged us onward, up to Harris Saddle. From there we could see a canyon below with a meandering river cutting through. We paused for a cup of hot coffee from our thermos and then continued on, wending our way around the peaks. The trail hugged the slope and swerved around viridescent foliage and the occasional highland daisy. We finally began our descent after spotting the next chalet at the bottom of the trail, a horseshoe lake spread out alongside it. As we dropped, trees sprouted up around us. They looked plush in their gowns of fresh thick moss. Tendrils of green hung from their limbs, dripping with the moisture of the day. Only in New Zealand are the picturesque mountaintop views matched by the splendor of the forests. When we arrived at MacKenzie Hut we were happy to grab bunks that were on the opposite end of the room from the Bostonians. Unlike the prior chalet, these bunks were setup like long beds with foam mattresses butted up against one another. Our hearts went out to the poor folks that would be sleeping literally next to the deafening couple. I hope they had thick ear plugs. It was Christmas day, and I was interested to see if the hut warden did anything special for the holiday, as I’d heard rumors of candlelight carols and treats. Katie and I waited in anticipation, making as lavish a Christmas dinner as we could muster under the circumstances: canned chicken, instant mashed potatoes, peas and dried cranberries all swirled together in a bowl. It was surprisingly good! (Well, for camping fare.) Afterward we indulged in hot cocoa and mini chocolate Santas. It wasn’t until night crept in that the caroling rumors were realized. Our hut warden came bounding into the lodge ho-ho-ho’ing in a Santa costume, his wife handing out tasty mince pies for everyone. I didn’t know what a mince pie was until I bit into the mini pastry and found cinnamon and spice filling – delicious! Oddly enough, Santa was joined by a man wearing a giant takahe costume. He had nothing to do with Christmas but he definitely added to the Kiwi flavor of the festivities. Candles were dolled out and a tiny flame made its way around the room from trekker to trekker. Lit by a warm glow, we sang old holiday favorites along with a couple New Zealand ones. It was a charming way to spend Christmas night. That evening we got our Christmas wish – a good night’s sleep far away from the Bostonians. The next hut was only three hours away, so we seriously dragged our heels come morning. We were the last to pack our bags, choosing instead to wander around MacKenzie Lake skipping rocks and taking photos. Once we set out, gnarled trees reached out and curled in around us. The foliage was otherworldly. If fairies existed they’d live here, for every hollow was filled with a welcoming cushion of green that looked soft enough to sleep on. Is This Where Fairies Live? We crawled out of the forest and ventured up, climbing along a ridge that exposed a panoramic landscape of snow-covered mountains. Up ahead Earland Falls poured out from an invisible spout and plunged into the ravine below. Little did we know that an hour later we’d be standing at its feet! It gushed full force, cascading from one point to another with liquid grace. Its spray, on such a hot day, was entirely welcome. A muddy path followed the waterworks, and we had to use some slick maneuvering with our hiking poles to make it down without face-planting. Thankfully, Howden Hut was less than an hour away by this point. Most people skip this hut entirely and carry on to the end of Routeburn Track, but since we’d be continuing our journey onto Caples Track we decided to stop here for the night. You certainly couldn’t beat its location: adjacent to a lake and looking up at mountains that glowed in the sunset. It’s also nestled at the base of a fantastic lookout called Key Summit – which is exactly where we went the next morning. After our informative tour / illogical obsession, we backtracked down to Howden Hut, grabbed our packs, and turned onto Caples Track. We were truly on our own at this point. No one else was looping back around for two additional days of trekking. We were thrilled to continue on. It had been a glorious hike thus far and we weren’t anxious to end it. Our quiet hike through beech forest and across a meadow led us to a steep incline cut deep with switchbacks. It was a slow ascent. We silently trudged up bit by bit for an hour until we finally reached McKellar Saddle. The terrain was flat across the saddle, with tussock grass sprouting up around a boardwalk that kept us above the muddy ground. Naturally, what goes up must go down, so it wasn’t long before we started our descent into a much taller and thinner forest than we’d experienced the day before. What a difference a mountain makes! We spotted our next hut warden hours before we saw the next hut. She was performing her duties, maintaining the track for us hikers and putting up hazard markers. There had been a landslide a few days prior and an alternate path had been cleared for us. Well, “cleared” isn’t exactly how I’d describe it. It was more like a series of arrows telling us to step up a small mound, into the woods, and make our way precariously through ankle-deep moss and rotting trees trunks. But we didn’t fall off a cliff, for which I was grateful. Upper Caples Hut was deserted when we arrived. Unlike the chalets along Routeburn Track, the Caples huts aren’t run by New Zealand’s DOC (Department of Conservation). Consequently, they are smaller, you can’t pre-book them, and they have less amenities. We grabbed bunks right away, delighted to find plenty of spots despite the cramped space. The best part about the hut was its nearby rushing river. The color of the water was pale blue, which was appropriate since that would be your color if you tried to swim in it. I should know, because after a long hike it seemed like a good idea to soak my feet. The bone-chilling cold hurt more than my aching! Instead, we enjoyed the river’s aesthetic qualities and sat beside it reading until the sandflies started assaulting us. Defeated, we retreated indoors. On our final day of hiking and we had until 4PM to reach the parking lot at the end of the trail where we’d be picked up by a car service. Signs estimated five hours of trail lay ahead of us, so we took our time to enjoy every moment. I was practically singing “Zip-a-Dee-Doo-Dah” because my, oh my, what a wonderful day it was. We traversed some of the most glorious meadows I’ve ever seen, with creeks whispering through the grass and sheep grazing on the hills. My heart felt so full and joyful that I literally shouted to the skies “I’m so happy!! !” It’s true! If God had erected a cabin and bid us live out the remainder of our days on that very spot I would’ve shouted “Thank you!” and shook his hand with gratitude. That was how happy I felt. The best part about the trail was that this heaven stretched on for miles and miles. We crossed a gushing gorge filled with turquoise rapids, meandered through pastures framed by granite peaks, and tread below towering trees that provided peace and tranquility. At times, our peace was interrupted by tiny green balls of energy called riflemen. We’d hear their squeaks and prep our camera only to have them fly away in rapid succession. These miniature birds were our favorite hiking companions. Too bad snapping a picture of them was like trying to capture an image of bigfoot. Later on, we ate a snack in a field where cows grazed alongside an apple orchard. Wildflowers sprouted from grass and granite peaks cut the sky. The scent on the wind was fresh and sweet, and we sipped its delicate flavor. Katie and I rested there for a long stretch of time, buzzing with the pure love of life. Even though we drew out our time as long as possible, we eventually made it to the end of the trail. We were sad to see it end. This RTW trip has reinforced for both Katie and myself that there’s nothing more fulfilling than venturing out into the wilderness with just your feet and a few provisions on your back. Our world is so ripe with beauty that it nearly brings us to tears. The Routeburn / Caples track gave us that rewarding feeling we were looking for, and it only made us crave more. Three months in New Zealand no longer sounded decadent, it sounded just about right!